This survey has been attempted to make a record of the main streets of Abergavenny. The town grew very gradually in size until the mid years of the 19th century; since then it has doubled in size. The Local History Society has concentrated on the main streets which would have been there since mediaeval times and now form the commercial centre of the town. 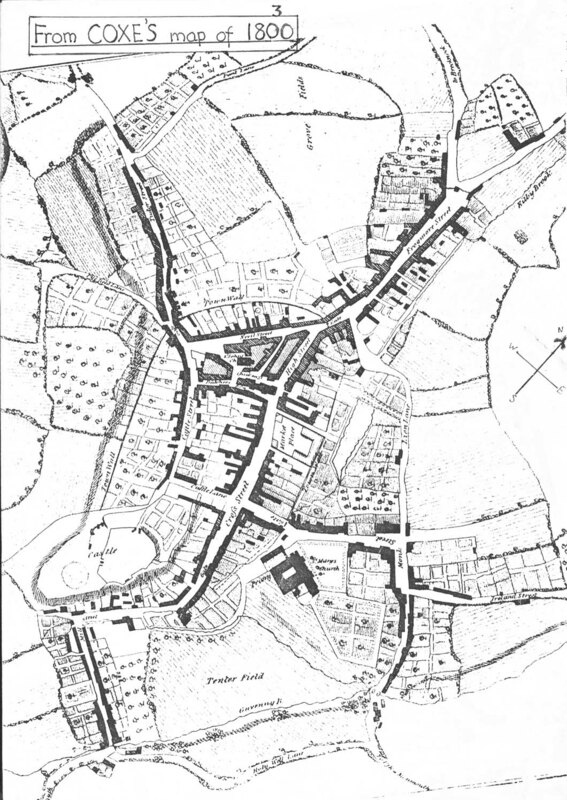 The two earliest detailed maps of Abergavenny are Archdeacon Coxe’s map of 1800 and John Wood’s map of 1834. Both these early maps show Abergavenny very much as it would have been in mediaeval times as far as street patterns and most of the building patterns are concerned. Over the years the area within the town walls was insufficient for the growing town. Wherever spare space was available this was infilled by buildings. Properties were extended behind premises fronting the streets, encroaching onto gardens and other spare land. Many of the streets developed courts where there was high density housing e.g. Tudor Street and Cross Street. Cross Street is the only place where this can still be seen – one small house still survives at the rear of the south side of Cross Street. A modern development or ‘mews’ has recently been added in Nevill Street, as would have happened several hundred years ago. The town also began to expand outside the walls along the roads leading from the mediaeval gateways along Frogmore Street, Tudor Street, Mill Street and Monk Street. Where these gates once stood the sites are now only remembered by the change of street name (in two instances): hence High Street inside the town and Frogmore Street outside the town, and similarly Castle Street and Tudor Street. The same change of name used to occur in Cross Street; below the Coach and Horses it became Mill Street, but now Mill Street only refers to the road running below the castle and then towards Monmouth Road. When this road was straightened, sometime after 1934, Cross Street began to be used for the whole of the road as far as the River Gavenny. When Leland visited Abergavenny between 1535 and 1543 he referred to it as “a faire waulled town, meately well inhabited”. Churchyard, who visited Abergavenny in 1587, commented that “Aboraynies Towne is wall round about and hath fayre Suburbs also”. In the 17th century Abergavenny was a wealthy town and much more important comparatively than it is today. It is situated where both wood and building stone are available for the construction of houses, so there would have been a variety of both building materials and building techniques. 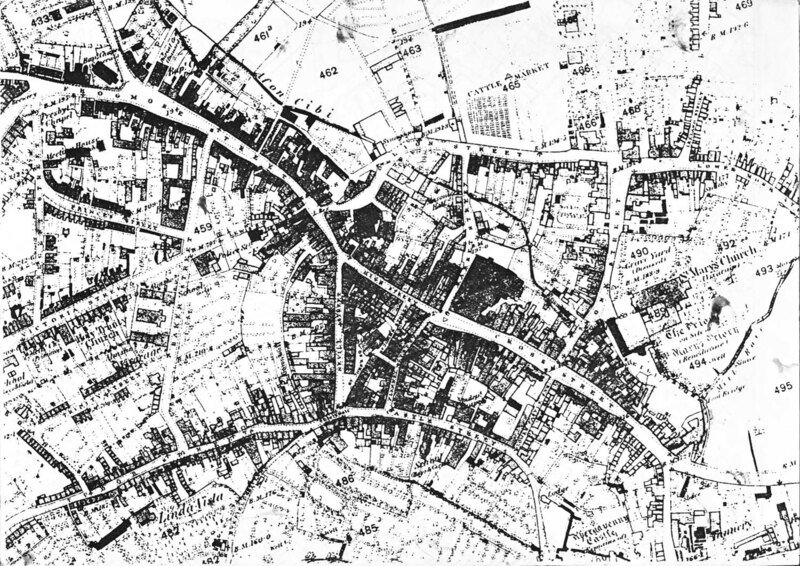 Some of these differences can still be seen today, for example by comparing Market Street with Nevill Street, but more is covered than revealed. Today the town is not so wealthy comparatively. It has undergone many changes, either the refashioning of exteriors or by complete demolition and rebuilding. These changes have always gone on, but the 20th century has brought an unprecedented rate of change. In two decades, the 1950s and 1960s, whole streets in Abergavenny disappeared – Castle Street, Tudor Street, Mill Street, Flannel Street and areas around St. John’s Church. Changes continue to be made, but not on such a vast scale – hence the need for such a survey as this. Many of the town’s buildings were updated at this period; however, many are much older than they seem. It is often only when a building is completely demolished, or alterations are being made, that features are revealed to show the true age of the building. For example, when alterations were being done to the Cow Inn in Nevill Street, it was found that this was originally a half-timbered house of the 15th/16th century to which the third storey was added in the late 18th century when it became the ‘Cow Inn’. No. 3 High Street, now occupied by Bollom’s the cleaners, was demolished and rebuilt in the 1960s. It had been a timber-framed building from which was recovered two very early lattice-work windows. No. 11 Cross Street which still exists is perhaps more typical of Abergavenny’s buildings. From the outside it appears to be early 19th century with a 20th century shop window. When the present occupiers, the Cheltenham and Gloucester Building Society moved in, a 17th century staircase was removed (it is now in the museum). A ground floor room still retains a fine 17th century plaster ceiling in one of the rear rooms. This survey has been complied to show to others who follow us what Abergavenny is like in the 1980s, and then to use the present as a starting point to whorl backwards to discover the past. This aspect of the survey will never be completed, more and more information can be added when time is available to do the research. The Local History Society has concentrated on the properties in the main streets which are subject to the most commercial pressure for change a of use and modernisation, and where indeed most change occurred. Philip Riden for the use of his negatives for most of our photographs; Messrs. Charles Price, George Davies, D.H. Thomas and others who let us examine old deeds; all the inhabitants of Abergavenny who have patiently helped us with our enquiries; and lastly, but most cordially, Bianca Emberson, who did all the typing. Those involved in the 1984 Survey including the slide collection which covers the same properties, were: Myra Cooper, Cyril Feldwick, Colin and Gill Johnson, Gwyn Jones, David Marples, Elaine Richards, Anna Tucker, Gwyn Walbyoff, Malcolm and Paddy Wills-Wood, and Beryl and Howard Pullen, who, by their ‘gentle persuasion’ held the group together. Beryl, with her skill and efforts, became our invaluable guide. if you wish to use any of this material for non-commercial ventures.